In general my nails grow well, in fact a few days ago I actually had to trim them down because they were getting a little too long, but I do have some problems with them. They are a little on the thin side and get quite soft when they're wet and I do also suffer from some peeling, which I tend to pick at (I know, naughty). One of the main problems with my nails though is that I suffer with what I call 'fault lines' which you can see running down several of my nails. I'm not sure exactly what has caused them, I'm assuming some kind of damage in my nail bed maybe, but I have been told by a manicurist that they'll never go, I can only try and improve the appearance of them. Buffing down my nails does help to minimise them but doesn't get rid of them completely and I don't like to buff my nails too often because I don't want to damage them. There was also a week patch on the thumb nail on my right hand and when that nail grew it would get to that point and break. Of course I've heard of OPI's Nail Envy and had previously bought it for my mum to try. As she gave me some good feedback I thought I'd give it a try myself. 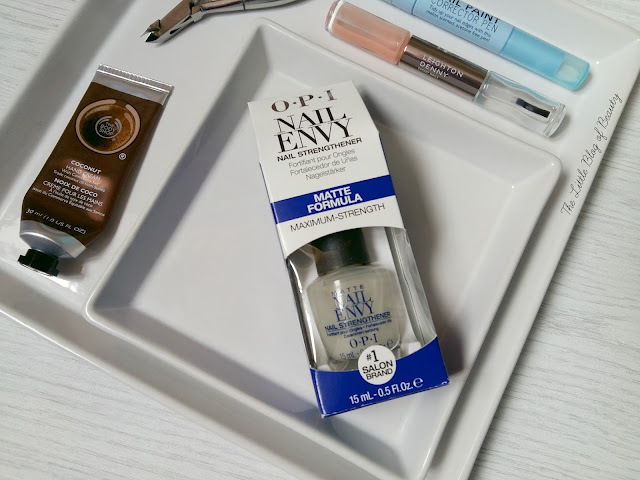 I bought my mum the original Nail Envy formula, which features a glossy finish, but I decided that I wanted to give the matte finish formula a try as I've never been a fan of the look of clear nail varnish on bare nails. Last year I discovered that I do actually like a really glossy finish on bare nails, the sort of finish you'd get if you had a clear gel manicure, but a standard nail strengthener gloss appearance doesn't do it for me. So I thought the matte formula might provide a more natural nail appearance. Nail Envy is formulated with wheat protein and calcium to protect against peeling, cracking and splitting. The pack instructions direct you to apply two coats followed by another coat every other day, but you can obviously also wear this as a base coat if you're a prolific nail painter. This comes with a fairly standard sized brush on it, not too big and not too small either, and the strengthener has a cloudy/milky appearance to it. When removing excess from the brush on the neck on the bottle you can almost see a white powdery type appearance run back into the bottle which my head says to me is the calcium, I have no idea if that is actually the case or not! I find that it dries quickly and leaves you with a really nice smooth matte effect on the nails. The best way for me to describe it would probably be 'my nails but better'. It perfects the look of your nails and makes it look like you have really nice healthy natural nails. Although your nails aren't completely matte, there is a slight sheen to them, it's probably subtle enough to be able to wear this without anybody realising you are actually wearing any kind of nail varnish. It's the sort of effect you'd get after giving your nails a good buff. In terms of whether my nails have actually benefited from using Nail Envy, I have seen some improvement but I haven't been blown away by it. I don't think this has had any effect on my fault lines but I have seen some improvement in the strength of my nails and the peeling and my thumb nail has got past that annoying breakage stage. As I said above my nails are also growing really well as I've just had to trim them down. In general the reason I really like using this is because of the amazing finish it gives my nails and if I'm not wearing nail varnish I'll be wearing this. OPI Nail Envy is definitely on the pricey side pushing £20 in Boots and through most retailers. However the most reasonable price I have found it for so far is £13.65 through BeautyBay, so if you do want to give it a try make sure you order it from there. Would you go for the matte or gloss formula of Nail Envy? I've used nail envy before, like you I thought it was OK but didn't have crazy results. I have since millionails by Essie and had much better results! !